Ok, wow. This has to be one of the most consistent YA reads I’ve experienced in a while! I had a strange chemistry with this book, let me tell you. I had bits where I was flailing in love, and bits where I’d lost interest in the action and wanted to take a break from reading it, but I kept coming back to it. This is a really good sign for me, if a book has me coming back to it not because I’m trying to make an effort but because it just calls to after I’ve taken a break of a couple days from reading, then it must be some serious awesomeness going on there on the overall. 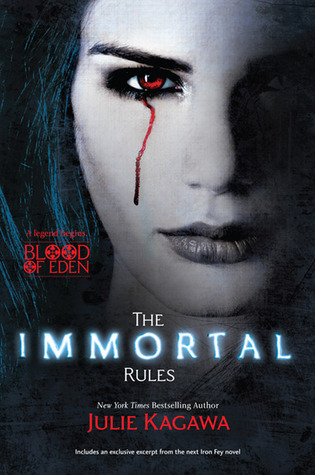 First things first, the world of The Immortal Rules is, simply put, genius. The concept of it, while delightfully horrifying and dystopian, is also quite touching and certainly emotionally gripping. I mean, being the kind of person and reader that I am, I will confess to being a lot more interested in reading the first part of the novel and the last one, New Covington was by far my favorite setting. Well, the areas right outside of the towns were re-he-he-ally cool too, all swarming with rabids. Awesome. I did not much care for the whole Jeb and Eden thing, just because raving lunatics score very little on my chart of interest, they can rave about death, God, environment, the afterlife or a pancake for all I care. So as soon as Jeb and his lot made an appearance, I was rather oscillating between PO-ed and bored. Those were the times I needed breaks from reading this. I’m not big on raving lunatics and the whole religious/pseudo-religious angles on things, I really am not. My read of this was the author’s world was built on contrasts, proper vampires i.e. scary ones that do feed on blood the old fashioned way, cerebral, organized but soundly vicious (yum!) versus rabids i.e. brain-mushed bloody beings bent on rampage and without much reason; the grim realities of the cities where vamp kings treated humans like cattle versus Jeb and his lot’s frantic, at times senseless search for Eden; Allison the vampire versus Allie the human being. We could go on and on with this, as I read numerous such pairings of opposites lighted up. That would have been a great source for constant conflict in all possible directions, a real seller in any book, except Jeb ruined it all for me. I’m sorry, I just couldn’t ignore the annoyance factor him and his crowd brought on. And yes, I will admit, I am including Zeke in that crowd. Me, I’m more of the Kanin character sort of fan, or Allison’s fan for that matter. Don’t get me wrong, the characters were built beautifully. Allison was the masterpiece of the novel, I won’t lie about that. She felt amazingly alive and real, and I was with it all the way. I loved her human and I loved her even more vampire, a katana wielding fierce fighter chick is an awesome idea to contemplate, let’s just face it. I was with her every reaction and feeling, she was amazing. Other characters were striking, but again my top favs will be the ones Allison lived with in New Covington, by far better for me then the Zeke&co crowd. I won’d say that no characters from the second bunch was remotely likable or anything, some of them were, but they were rather out of the spotlight so the overall effect was one of general cringefest for that group, sorry. I was actually secretly rooting for Allie to go on picnic rampage on those suckers pretty much all the time, Jeb and Ruth taking center spotlight for the entrees. This obviously says a lot of the characters were really, really well built, because it takes work for me to have a real emotional reaction, positive or negative. In this novel I had plenty of both, so it’s pretty obvious the writing was top notch in my opinion. If I’d have to highlight some less then stellar points, the length would come to mind. Don’t get me wrong, I’m not the lazy sort of reader, I don’t need my full course to be over in 250 or 300 pages at most. It’s not the text in itself that I found at times lengthy, but the focus on certain parts of the action overall. I mean, of course being a little mean I’d sau we could have skipped those annoying Jeb&co crowd a lot, but seriously speaking, there were points in the book where I felt like the action was a bit too slow. There wasn’t much romantic tension in those moments to keep me super focused in either, the romance angle is very light. This is not necessarily shocking, this is a YA, but I believe a bit more romantic tension would have held me more in tune with everything in those less alert spots. Now, what I especially want to point out is this novel was very visual for me. That doesn’t mean there are chunks of descriptions in there, by no means. This means that I had a lot of moments, especially the Allison in action ones, that made me see it all in anime style, you know what I mean? I’m a huge fan of anime so that was a really, really positive association for me. The katana might have nudged me even more in that direction, I will admit. Awesomeoness, so much awesomeness, the katana action alone is a clear 5 out of 5. I’ll end by saying that cover is freaking amazing!! I mean, seriously, soundly, freaking amazing. Do you like romantic angles to be more or less explored in YA? How do you feel about longer books, like this one is? Does the length of a book ever influence your will or desire to dive in the read?